The Combiner Wars Voyagers and Deluxes have been spotted at retail, and now users Goggle Convoy and Reluctantyouth have just spotted Transformers Generations Combiner Wars Legends at Toysrus. Goggle Convoy spotted his at TRU in Raleigh, NC, while Reluctantyouth found them at Peoria, Il, and even provided some pictures. These legends figures are priced at 9.99$ US. The planets aligned so that this news sighting would come just in time for you to check out these figures in our high definition galleries! I have also found them at a ToysRUs in Southern Illinois. 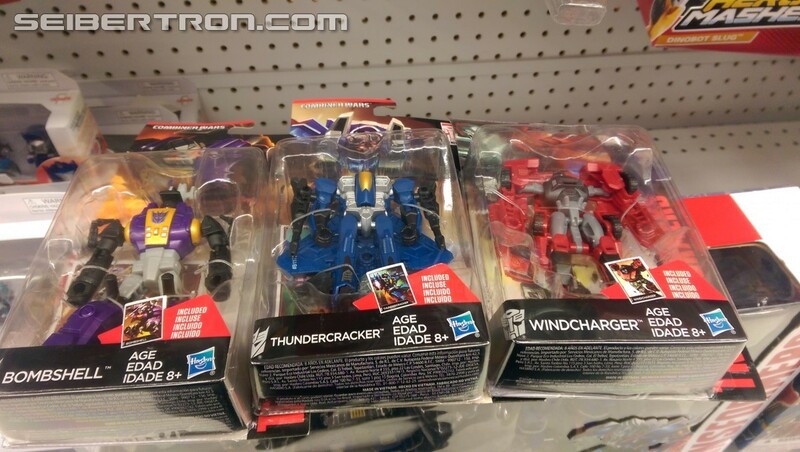 Thundercracker, Powerglide, Bombshell, and Windcharger. Really? But didnt the ones that came with the target masters cost the same amount? God, as awesome as this is, I know for a fact these will never hit my local Toys "R" Us anytime soon. They're still stocking the first wave of Fall of Cybertron Legends two-packs. Mindmaster wrote: God, as awesome as this is, I know for a fact these will never hit my local Toys "R" Us anytime soon. 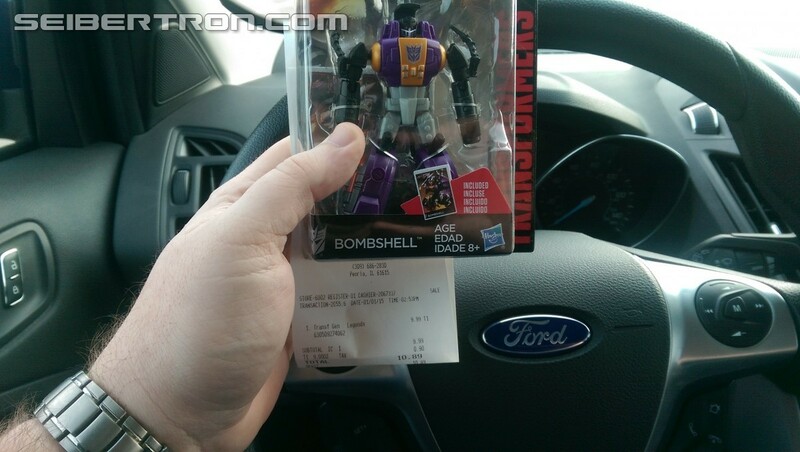 They're still stocking the first wave of Fall of Cybertron Legends two-packs. Surely, the Targets and Walmarts in your area have better stock, no? The local Walmarts are just now stocking Shrapnel. Target is really my only hope at this point. Yeah, they did. And before that were the bigger, more articulated PCCs and HA Basics and their partners at that price. .... and every one of those did terrible in my stores. So either these things will shelfwarm like crazy, or everybody will happily pay more for less. I'm not sure which is better. Wait, really? I found Windcharger the day after Christmas at Target for $9.99 but I didn't think it was news. These have been at Target for 2 weeks now and the Deluxes for 1 week.Only assortment not to show at retail has been the Voyagers. 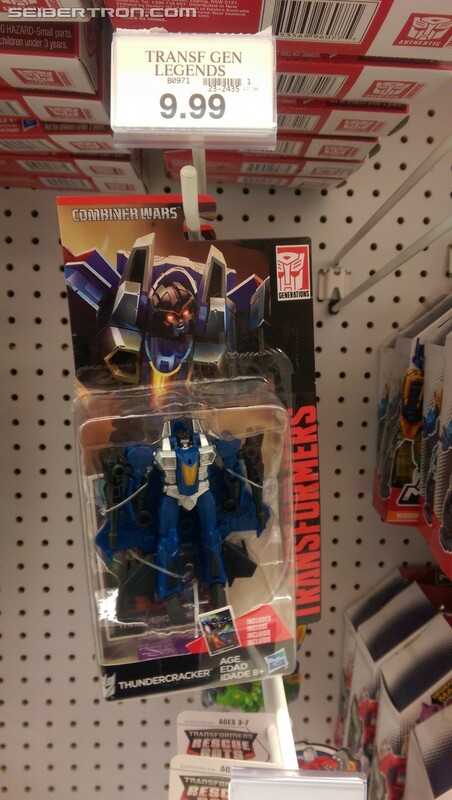 I found Robots in Disguise at Target already as well. Have you guys been writing these sightings in your respective sightings thread for your area? It would be a much better place than here because it could help fellow fans know exactly where they can find these figures. It's true. I've found all the wave 1 legends at TRU, and at the local Target stores as of Jan. 1, 2015. So I was able to start the year with some good luck after all. I found the wave 1 warrior figures from RiD in TRU as well, though so far I haven't felt the desire to buy any - I'm lukewarm to that whole line as of yet and can live without them. Shockwave7 wrote: It's true. I've found all the wave 1 legends at TRU, and at the local Target stores as of Jan. 1, 2015. So I was able to start the year with some good luck after all. I found the wave 1 warrior figures from RiD in TRU as well, though so far I haven't felt the desire to buy any - I'm lukewarm to that whole line as of yet and can live without them. That Powerglide is a great little figure, so glad I didnt buy the Universe, Transbots or Make toys one. Picked up Firefly this afternoon, leaving me done with Wave 1, really liking this wave, the best thing Hasbro has done in a long time. Bing on Wave 2 and (hopefully) Devestator. This is OLD news. These have been at target and TRU since the week before Christmas. New stock photos for the six Stuncticons, Air Raid, Huffer, and the Megatrons. Sabrblade wrote: New stock photos for the six Stuncticons, Air Raid, Huffer, and the Megatrons. Don't know if it's because I'm on a mobile but Motormaster looks very light. Promo pics showed dark grey/black with a purple face. I like the way Dead End and Beeakdown's chests conceal th pegs better and Offroad does look cool, despite not being Wildrider. Megs looks decent, but I really wanted him in Voyager class to stand toe to toe with my Classics Prime. Megatrons looking better in these pics, however I cant stop thinking how much better the mold would look as Shockwave. Hasbro.com has updated with new official high quality promotional images of Generations Combiner Wars wave 2 Deluxe, wave 2 Voyager and wave 1 Leader Class figures. They even give us a new peek at Menasor. 4,669 pages were recently viewed by 445 unique visitors. This page was viewed 1 times on Wednesday, April 24th 2019 3:12am CDT. © 2019 Seibertron, Inc. DBA Seibertron.com. All Rights Reserved. Established June 2000. Seibertron.com is owned by Ryan Yzquierdo.